Raung volcano, East Java, is one of the most active volcanoes in Indonesia. The volcano has recently made the news headlines as its latest activity has resulted in the closure of Denpasar airport during peak holiday season. On 29 Jun 2015, Indonesian authorities raised the alert level for the volcano which was sending ash up to 3500 m and depositing ash on villages up to 10 km from the summit. The eruption continued to produce a steady stream of ash and on 2 July, a volcanic ash advisory (VAA) was issued, despite the cloud not yet being visible on satellite data. Further VAAs were issued by the Darwin VAAC over the following days. As the stream of ash continued to blow ash from the volcano south-east towards Bali, the airport was forced to close on a number of occasions from 2 – 12 July along with another four airports in the region, to ensure flight safety. A change in the wind direction on 13 July allowed the airport to re-open and flights to clear the backlog to resume. Satellite sensors can be instrumental in monitoring the distribution and dispersion of volcanic ash clouds, providing a unique perspective not possible from the ground. The images below come from the AIRS sensor, on board the NASA Aqua satellite. 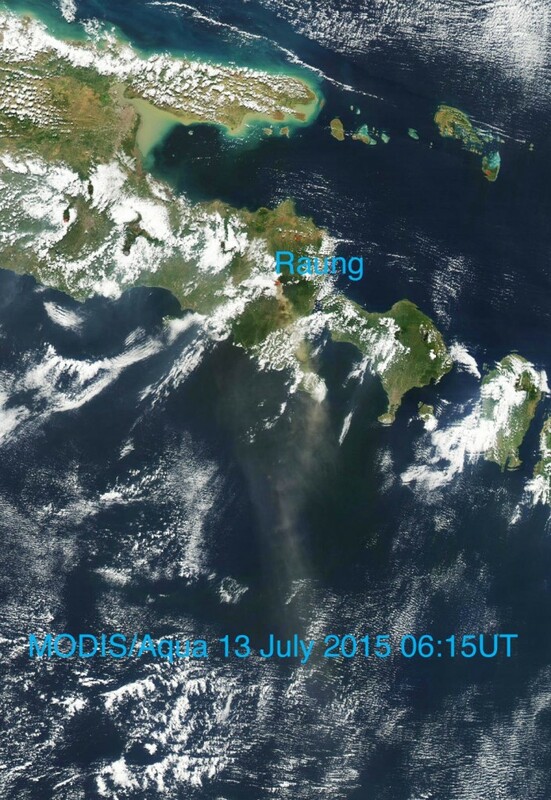 The VIS/NIR image below shows the ash cloud moving south-south-east, just to the west of the Ngurah Rai airport (Denpasar) on 12 July. The AIRS instrument is also able to detect ash using the brightness temperature difference (BTD) technique. 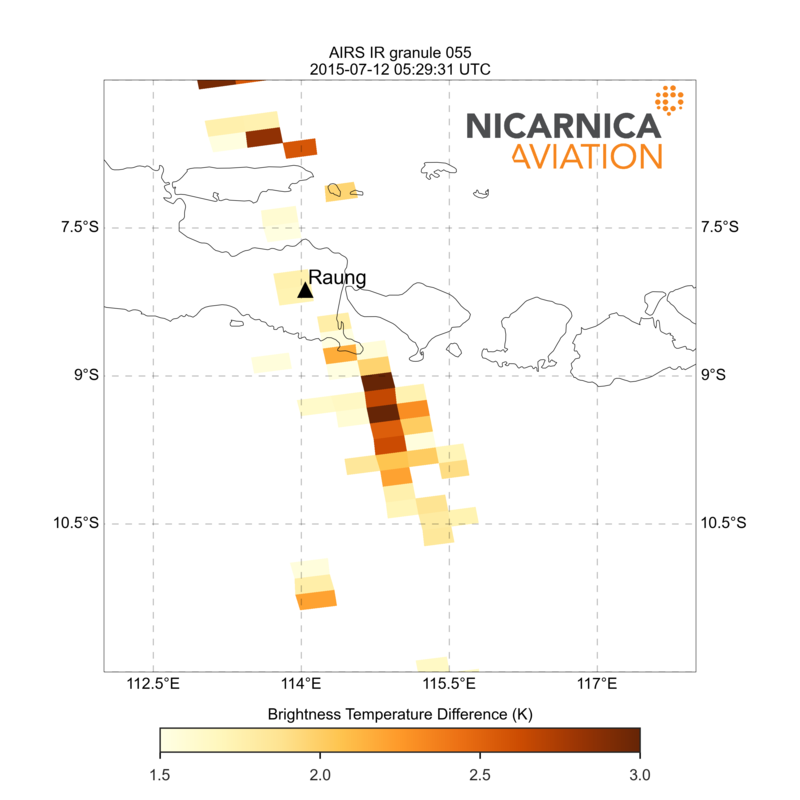 The scrolling gallery below shows the AIRS brightness temperature differences for three AIRS images captured on 12 and 13 July, where a larger BTD typically indicates a higher concentration of ash. The reduction in ash close to the airport is evident on the 13 July (when flights resumed), but the indication that ash was still present in the region allows pilots to take necessary precautions. 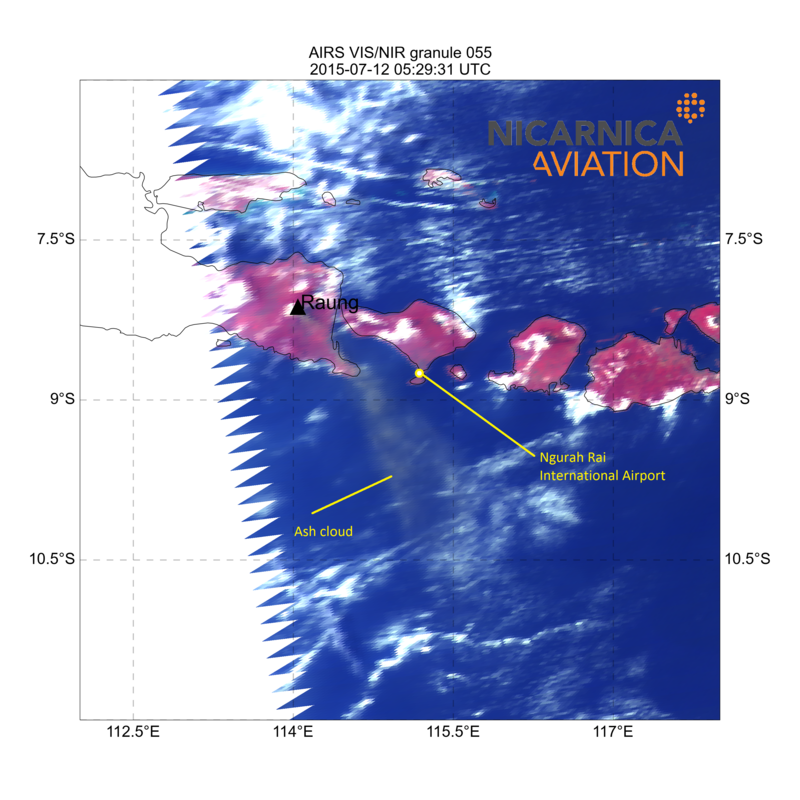 The ash cloud was also imaged by the NASA MODIS instrument, also on the Aqua platform. The image from 13 July at 06:15 UT is shown below. Jetstar Airways and Virgin Australia have both had flights disrupted due to the ash cloud and information for affected passengers can be found by clicking the respective links.